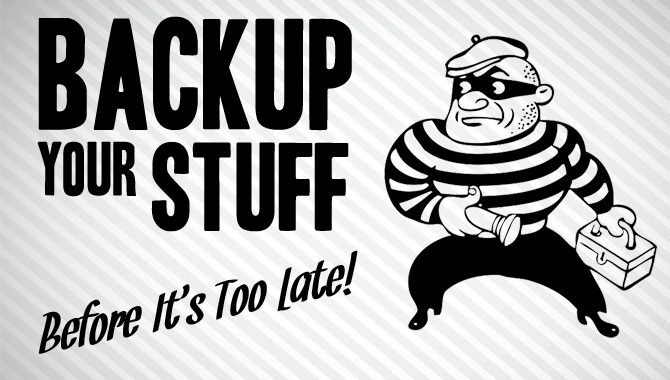 Home/Backup, blog/3 Best Practices For Backup your stuff before it’s too late! If you haven’t lost data then you will. That’s the nature of digital information. It likes to get corrupted or disappear for seemingly no good reason. Do you have regular backups? Will you be able to recover when that happens to you? Because it will. Data loss isn’t just a result of accidents. It can be caused by malicious activity as well. I see it all the time in my line of work. Cybercriminals get the giggles when they see how they’ve screwed up your life. It’s what they do. So let’s look at some ways that data loss can occur as a result of malicious activity. Use your imagination here. The crooks do. Viruses and other devious software like to mess with things. Sometimes this means deleting your files, sometimes it means corrupting them beyond repair. Some malware likes to target your operating system. That is, in most cases, Windows. Frequently they will corrupt the boot sector or some critical boot files and your computer will no longer start. When ransomware gets on your computer, it will take your files hostage, sometimes with unbreakable encryption. Once you pay the ransom fee, it will (hopefully) give your data back. But if you have backups, you haven’t lost anything and the ransomware has no power over you. Sometimes evil hackers will break into computers and do horrible things. At that point, all of your data is at their mercy to do with as they will. Is everyone you let into your home trustworthy? What if you come home to find the repairman browsing your files or visiting malicious sites on your computer? Are your coworkers trustworthy? Laptops, flash drives, phones, and every other type of digital device are stolen all the time. Would you lose your data for good if one of your devices suddenly went missing? What is Cold Backup Versioning? “Cold backup versioning” is just a mashed up term I use to describe two separate backup strategies: cold backups and backup versioning. Both methods should be included in your backup scheme. So how do we put this stuff into practice? Here are my favourite security-minded strategies that might work for you. By far the most convenient method. These services monitor your files for changes then back them up to their servers online automatically, so you don’t have to remember. This isn’t technically a “cold” backup because it’s always connected by default. But it does have some of the same features, like protection from power anomalies. And they all typically provide backup versioning, keeping a history of changes to your files. The following services are good ones. Also called local backups. Keep in mind these backups will not be protected from theft or disaster. Only offsite backups (like the online services above) can do that. For local backups I only recommend Acronis. I’ve used it for years and swear by it. Do not use a thumb drive. They tend to get lost and corrupted too easily, and hard drives have more room for backup versioning. Set it to at least once a week, but some software (like Acronis) will let you keep up-to-the-minute backups too. Unplug the external hard drive between each backup if you’re not keeping a continuous backup. This prevents viruses and power surges from getting to it. The vast majority of your backups will never be needed. You’ll go for months or years and think, Why am I doing this again? Here are some excuses I hear when people stop their backups. Believe me, I’ve heard them all. STICK TO YOUR BACKUPS. The one time you might need it in three years will be well worth the inconvenience. If you ever experience catastrophic data loss like I have, you’ll probably get paranoid about it like I am. Please don’t let that happen before you decide to get on the wagon.